H.E. The French Ambassador to India, Mr. Alexandre Ziegler will inaugurate the 4th World Living Heritage Festival here at the Sabhagaar Conference Hall, The Durbar Hall, Fateh Prakash Palace Convention Centre, on October 18th, 2018. What has been described as a fascinating festival focused on living heritage, the visit and participation of the French Ambassador to one of the ‘Best Cities in the World’ is setting the stage for an impressive roll-out of events in Udaipur. Udaipur (voted by Travel + Leisure as among the World’s Best Cities for the third time in 2018) was built by the Maharanas of Mewar in the 16th century, on the banks of Lake Pichola ringed by mountains and hills. The 4th World Living Heritage Festival, being organised by the Maharana of Mewar Charitable Foundation (MMCF), jointly with UNESCO New Delhi Office, is bringing together a spectrum of artists and academicians, activists and student-delegates from India and overseas. Rajasthan Tourism, Ahmedabad University Centre for Heritage Management, Singhad Institutes and Dronah Foundation, Gurgaon are supporting and actively associated with the Festival. 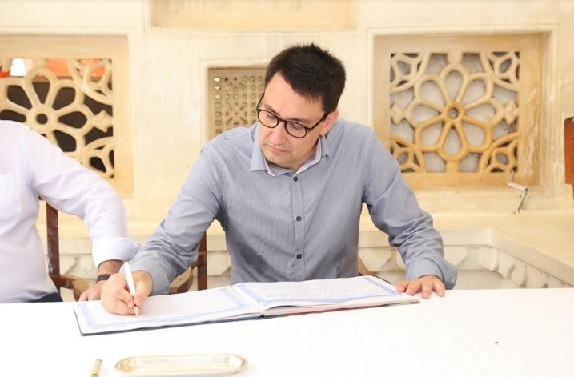 Mr Alexandre Ziegler's gracious presence at the 4th Festival will strengthen the continuity between France and India as his predecessor, Mr. Francois Richier had actively participated during the 3rd and the 2nd World Living Heritage Festivals in 2016 and 2014 respectively. On October 17th, 2018, the Festival will begin with Ashwa Poojan - A Timeless Gratitude to Equinity. It is a ‘regal festival’ where Shriji Arvind Singh Mewar, as the 76th Custodian of the House of Mewar, worships the horse and reaffirms the time-tested ties of the warrior with his steed. The Festival will be a feast for the tourists who throng Udaipur during the season and its residents who have an ear for music and care to laud the talents of both young and veteran artists.